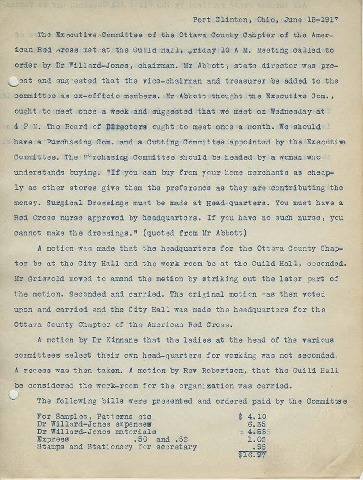 This digital collection features select items from the American National Red Cross, Ottawa County Chapter records (MMS-0008), which consist of meeting minutes and financial records relating to the Ottawa County Chapter of the American Red Cross during the period 1917-1919. This digital collection contains only a selection of items from the American National Red Cross, Ottawa County Chapter records. The full collection is available for research at the Center for Archival Collections. View the collection catalog record. 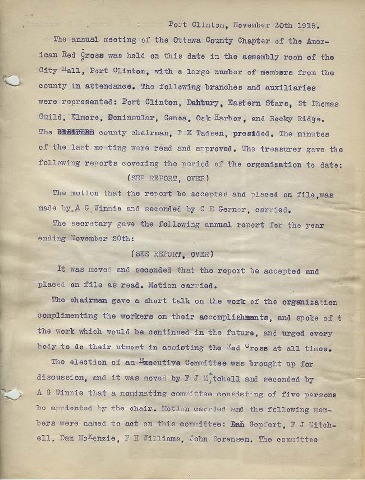 June 1917 minutes of the Ottawa County Chapter of the American National Red Cross, noting the establishment of a War Fund Department and a Civilian Relief Committee to aid in the U.S.'s World War I effort. Minutes from the November 2018 annual meeting of the Ottawa County Chapter of the American National Red Cross, including summaries of the chapter's work on behalf of American soldiers serving in World War I. First minutes of the Ottawa County Chapter of the American National Red Cross. 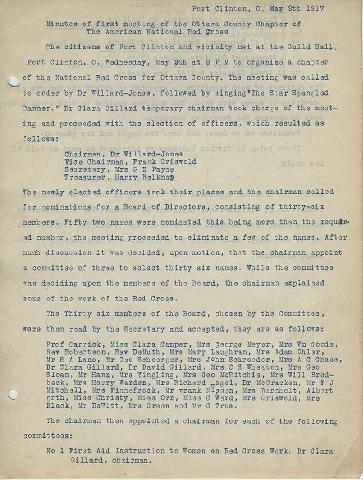 As shown in the minutes, the chapter established several committees to aid in the U.S.'s World War I effort, including the Fighting Men, Aid of Dependent Families of Soldiers, and Discharged Soldiers Committees.